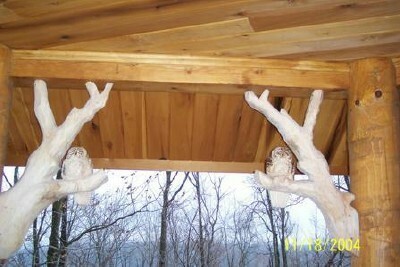 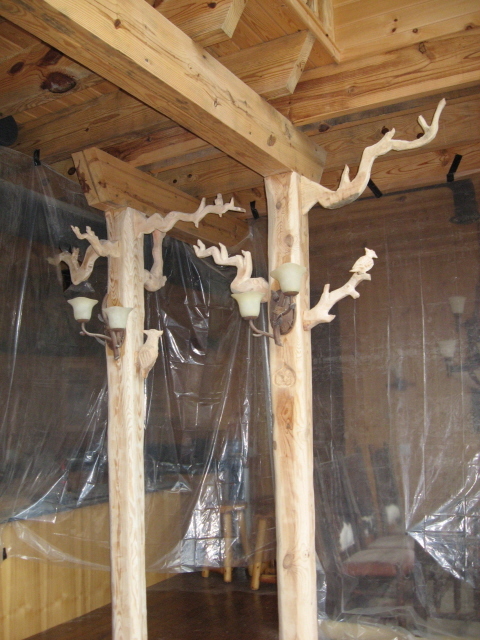 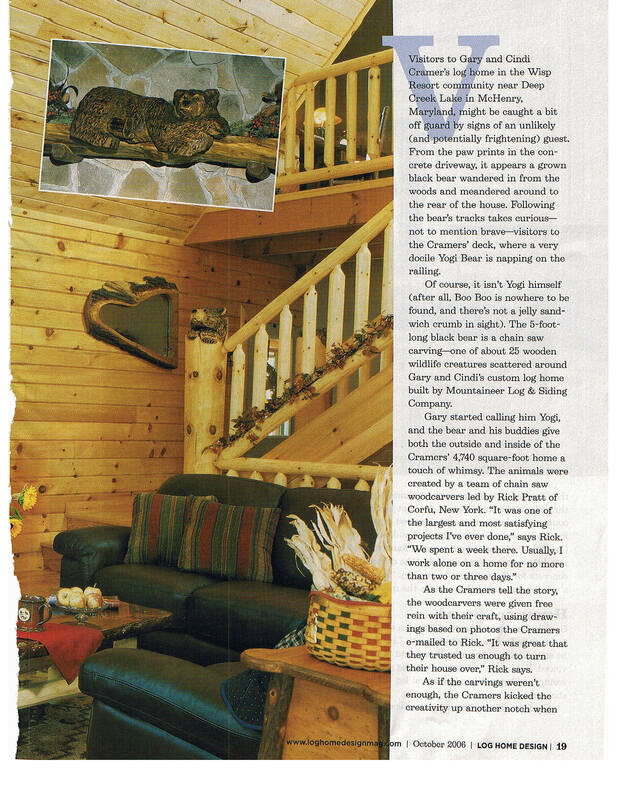 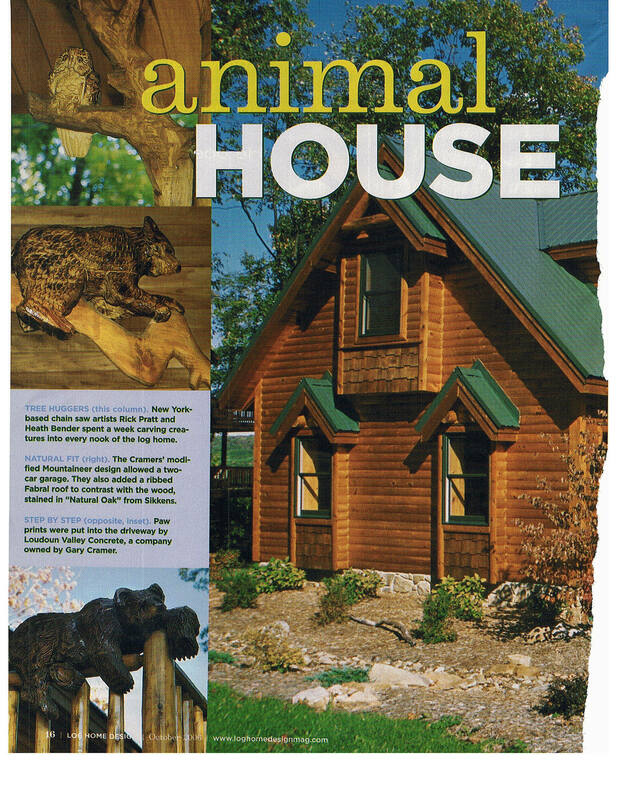 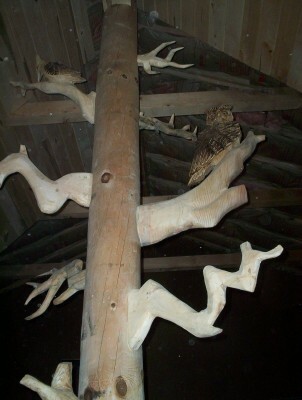 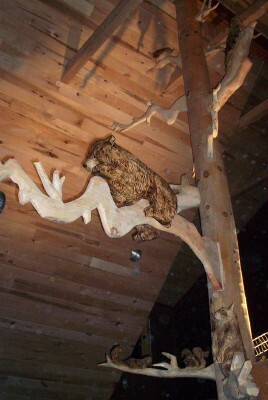 This Home had minimal posts within, so Branches with Animals were attached in order to create a more "Woodsy" appearance. 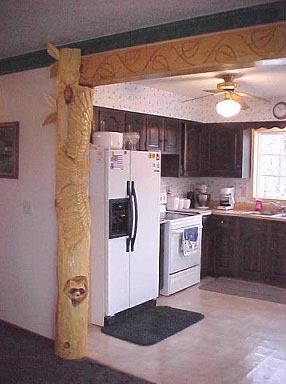 The home front where posts were added to connect the inside and outside decor. 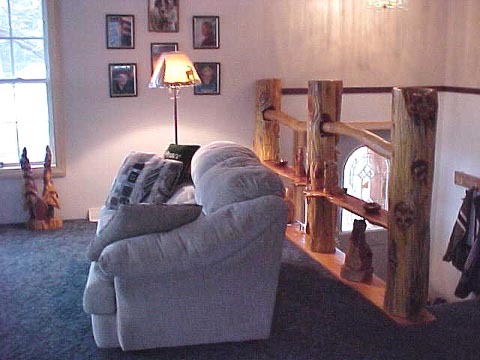 This Railing Project was created in conjuction with my Friend, Randy Boni. 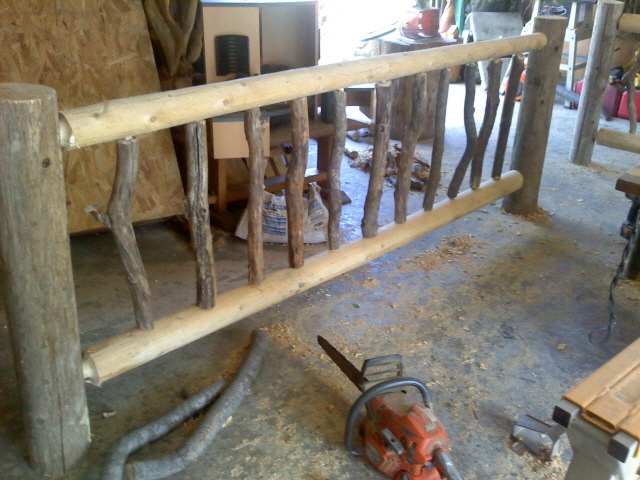 We harvested the "rails" from the woods on property. 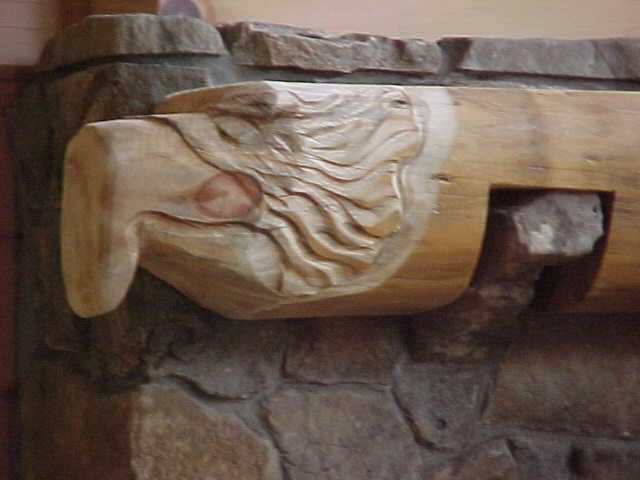 "Soaring Eagle" This Eagle is carved on a column that frames the Kitchen and the eagle looks as if it is flying into the Great Room. 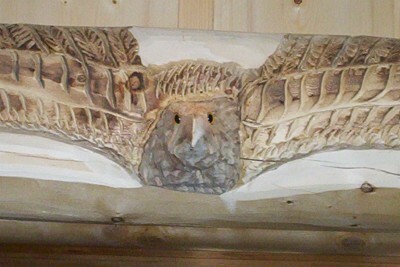 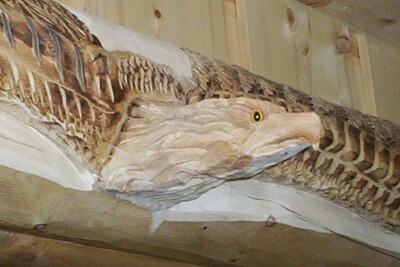 The Head is a separate piece of wood that is doweled onto the beam. 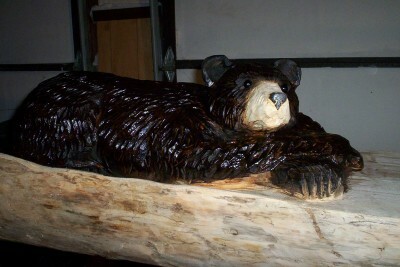 Wood burning and glass eyes create a realistic sculpture that the owners were very happy and excited about. 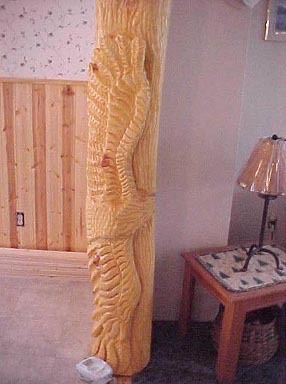 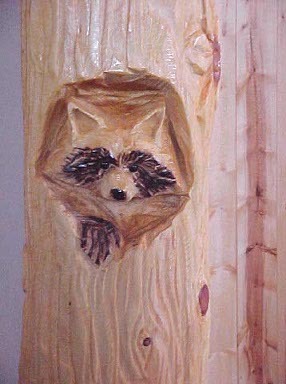 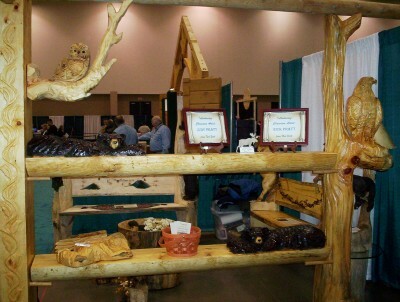 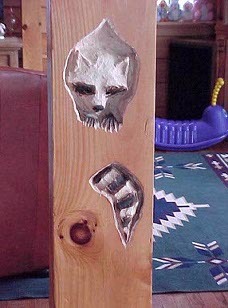 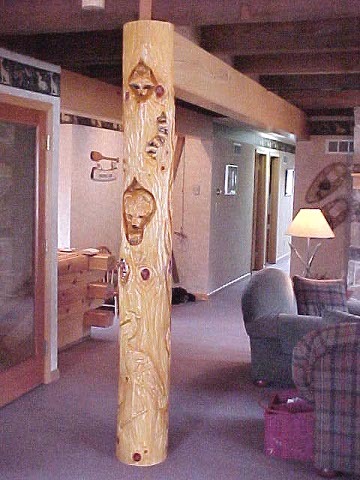 Rick also carved a few of his other interior posts. 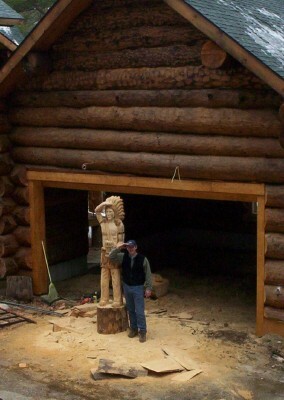 "Rick & Judy Pratt - Chainsaw Artist Extraordinaire"
"After seeing in person some of their work and artistry I had to have them do some work for me in my new log home. 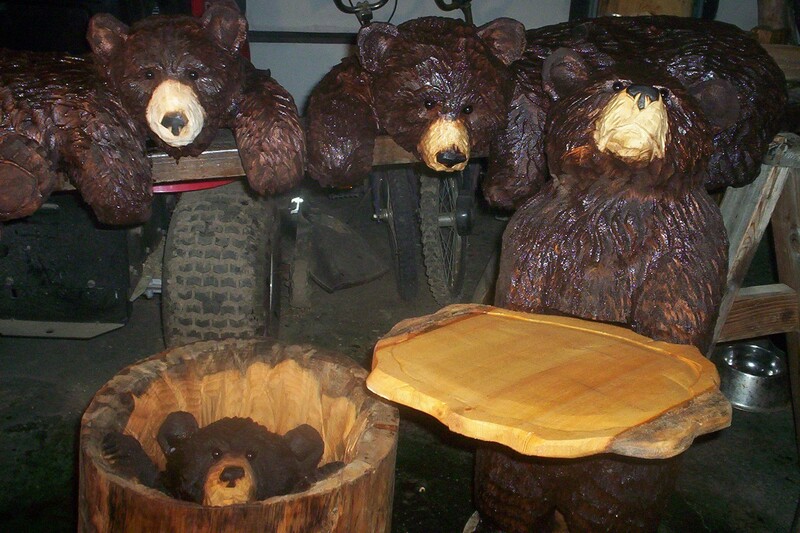 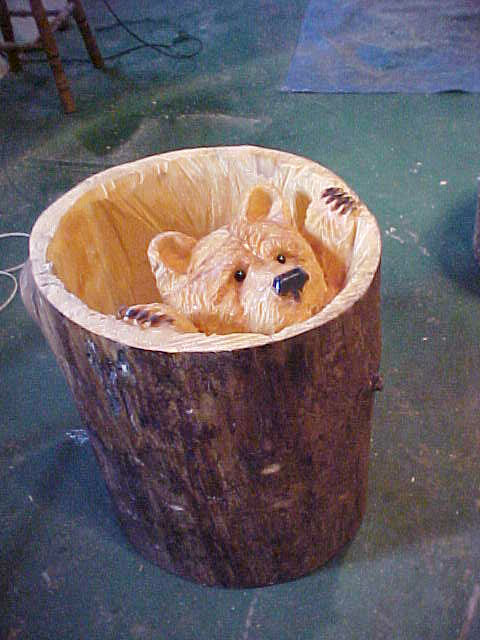 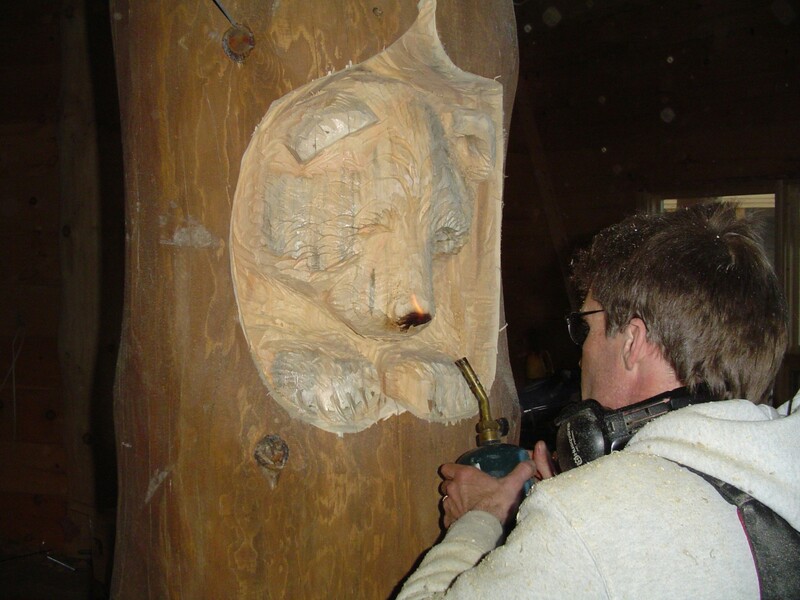 Rick is a master carver with the chainsaw and has an uncanny sense of vision and detail in each of his subjects. 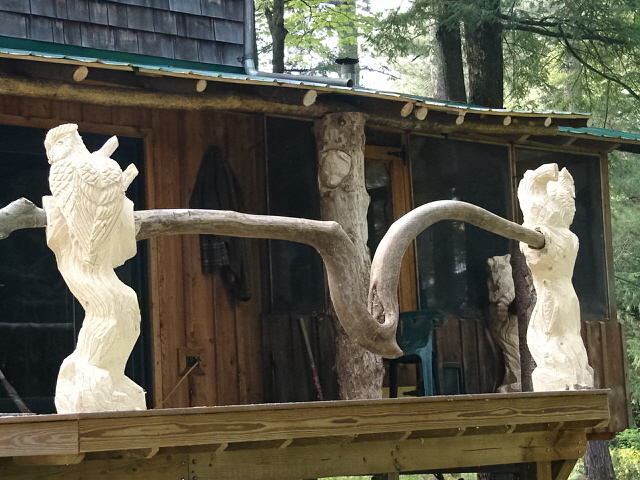 I cannot say enough about his gift of creating life-like sculptures and will recommend him and his wife to anyone who appreciates and enjoys this type of artistry." 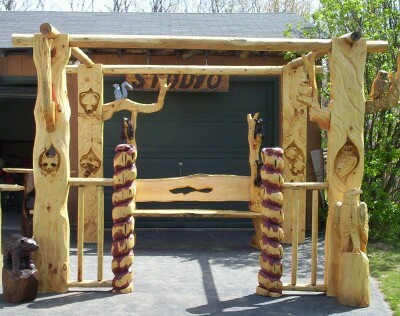 Will also show their work upon request and appointment. 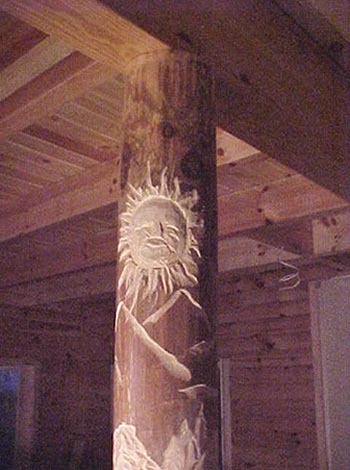 These Columns were added after construction. 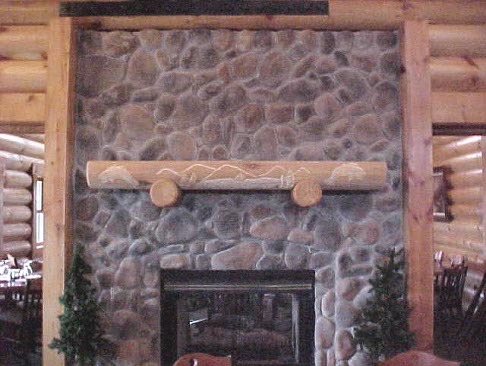 Side filler carved columns can be placed against a wall. 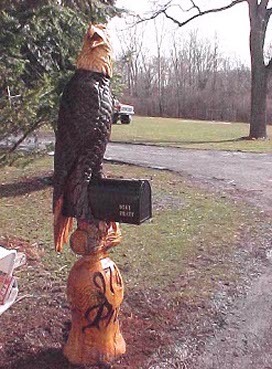 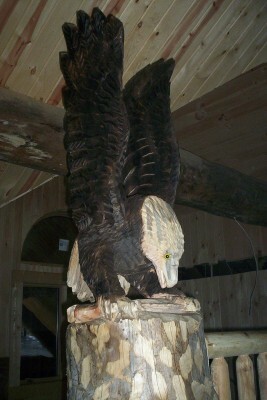 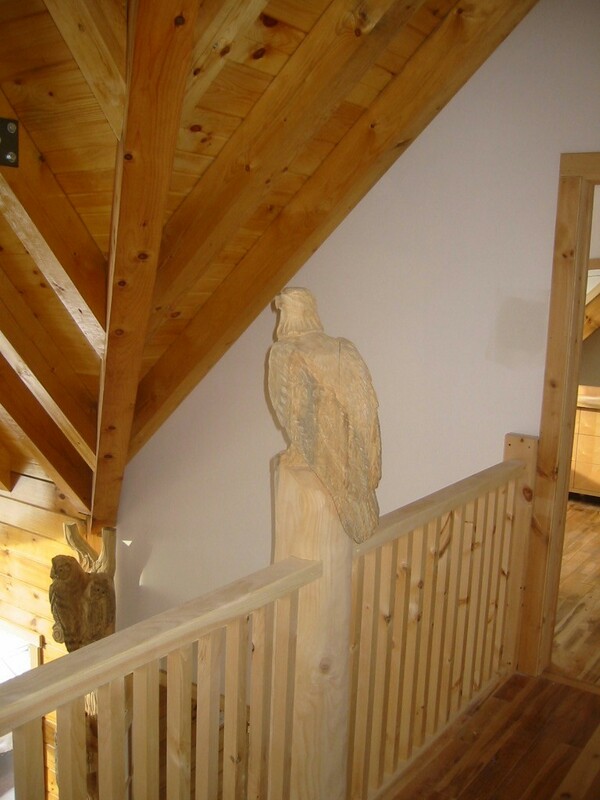 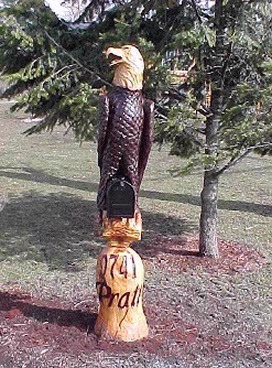 Perched Eagle custom made knewel post was also carved in our Studio and then added to the finished home. 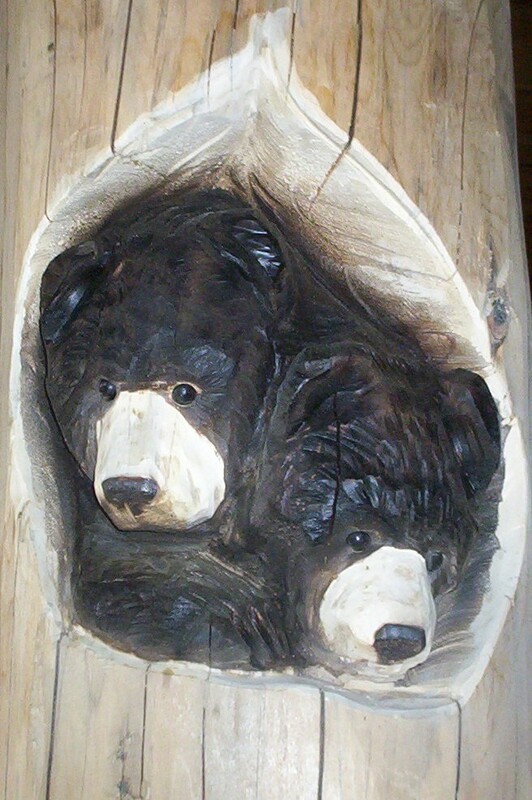 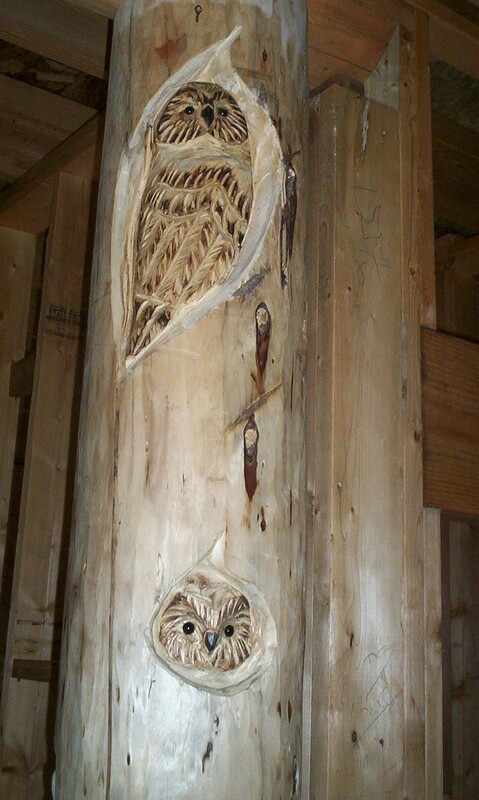 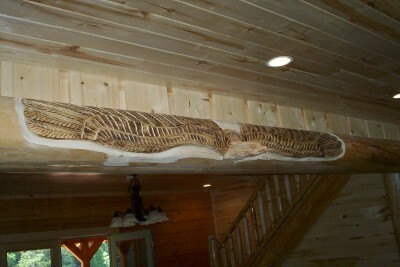 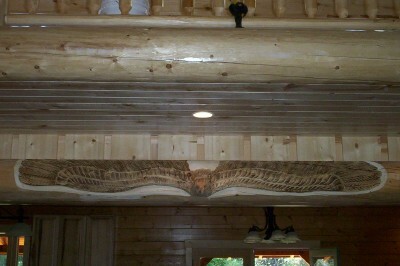 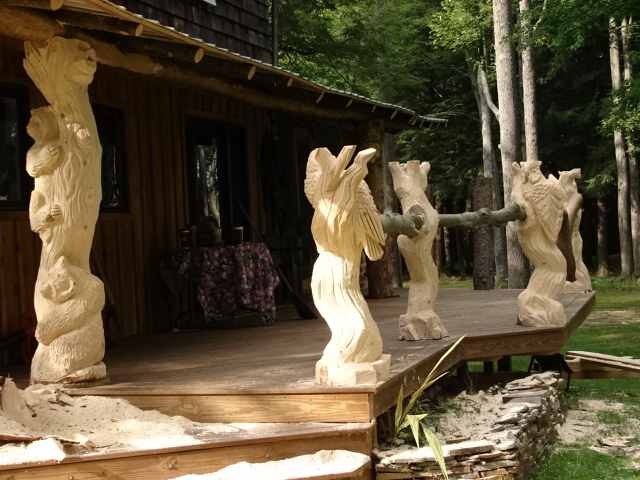 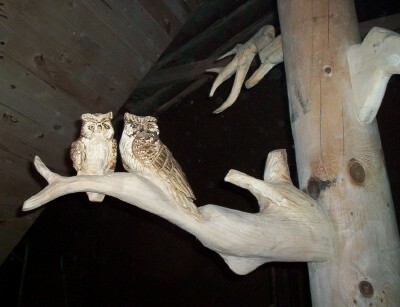 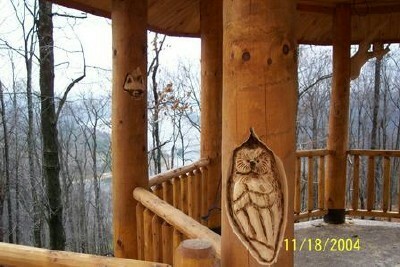 These Hollow Carvings were carved in 8" square posts after the Log Home was completed. 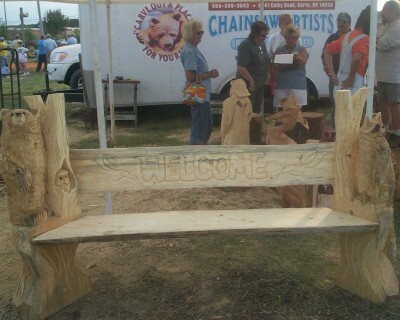 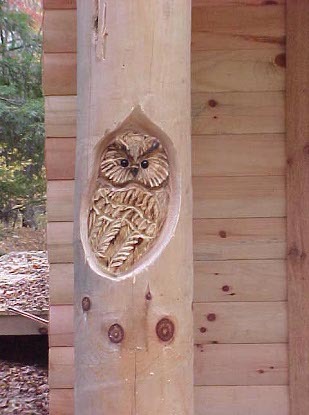 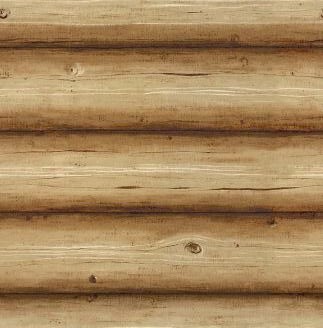 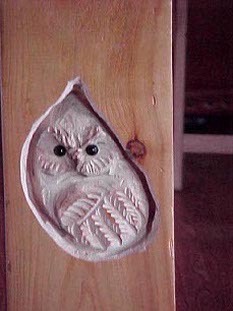 Carvings can be achieved in square or round posts, on newly constructed or finished homes. 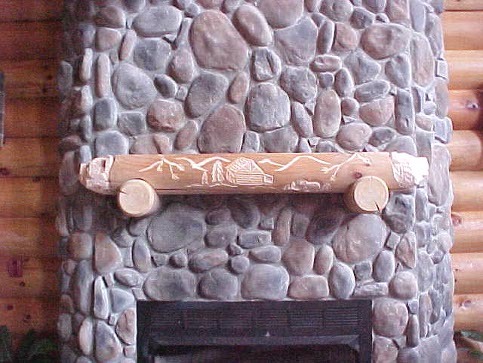 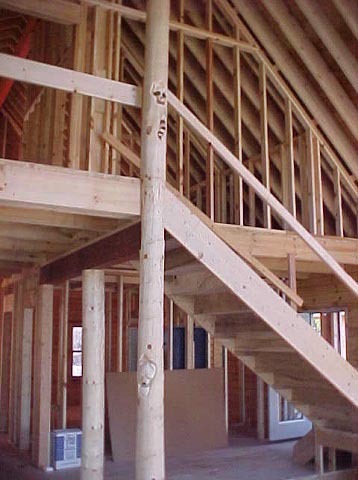 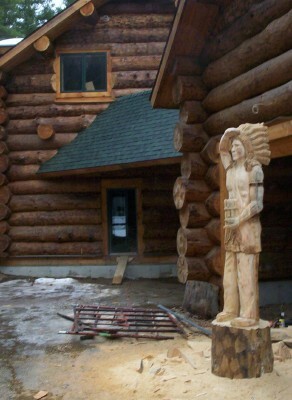 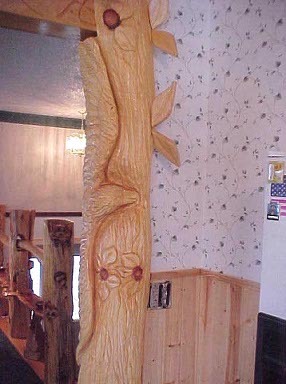 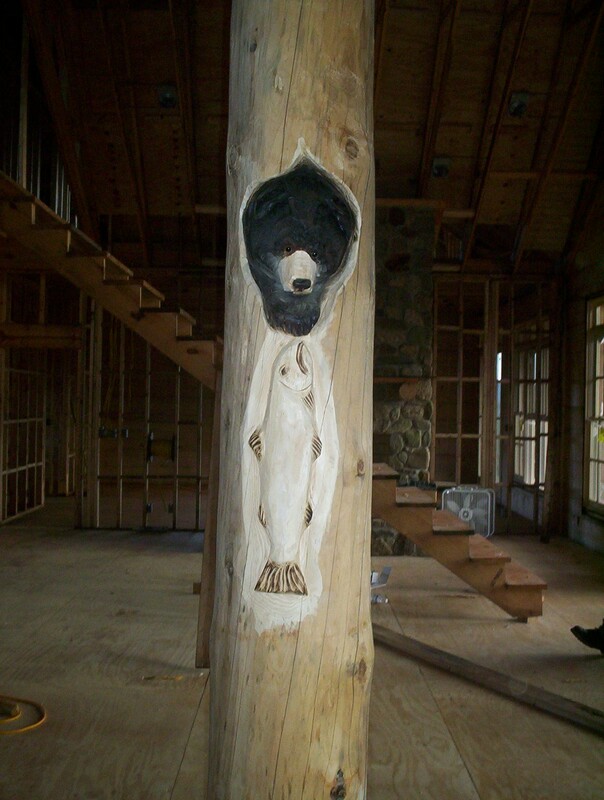 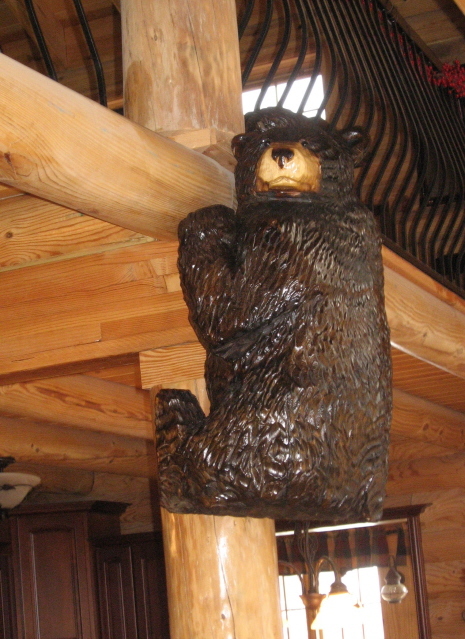 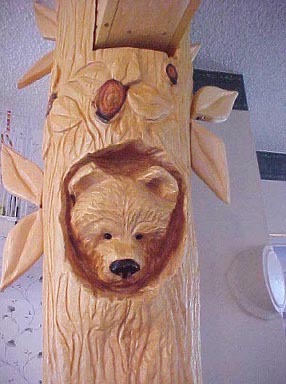 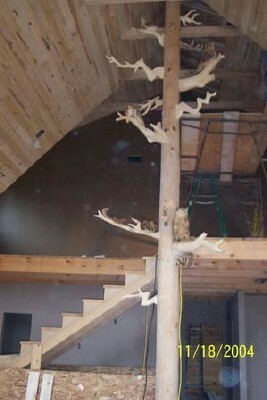 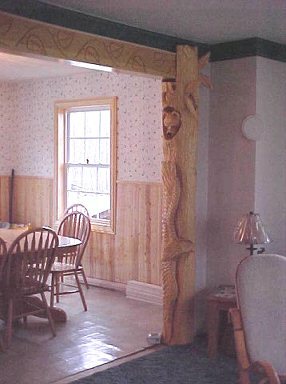 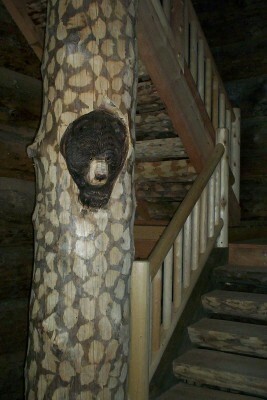 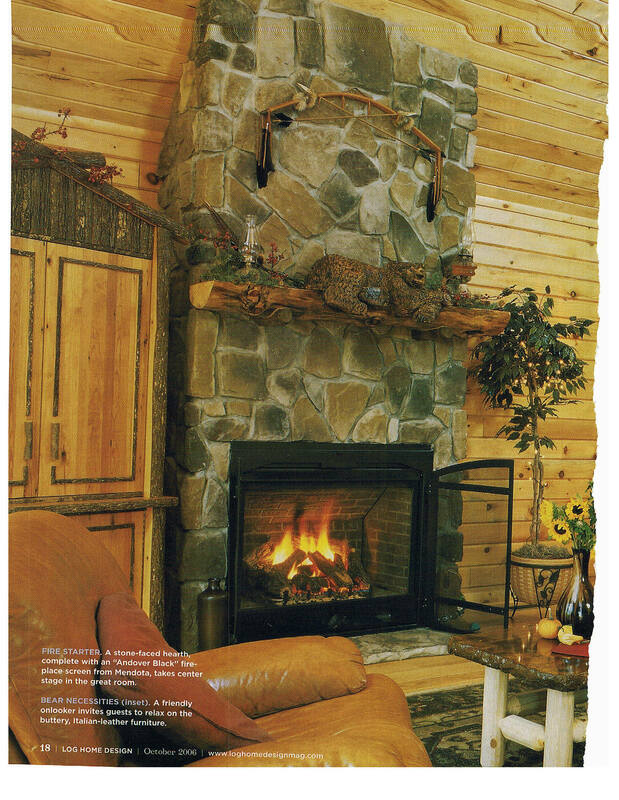 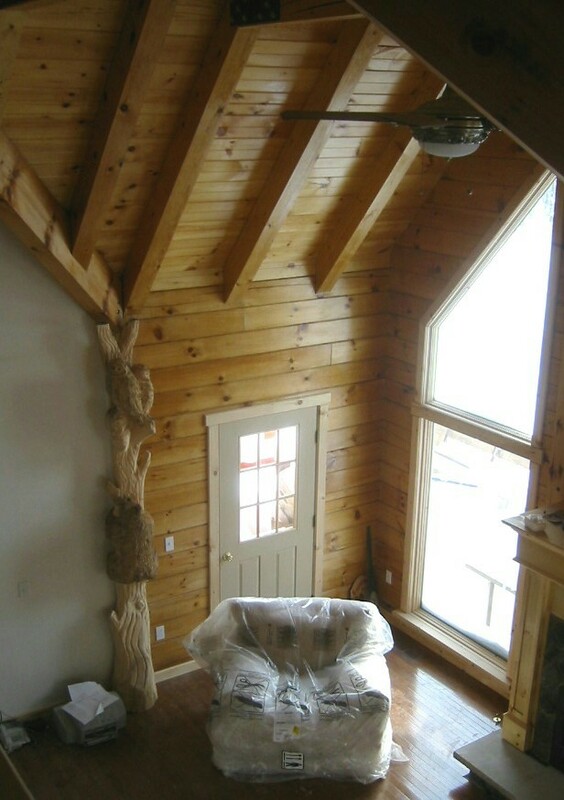 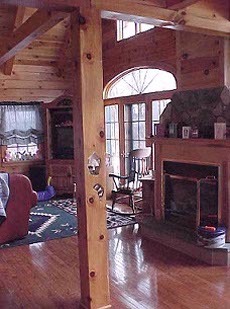 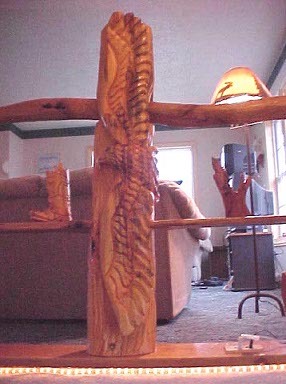 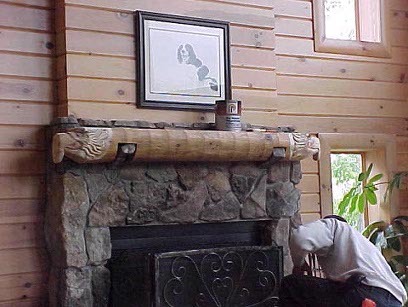 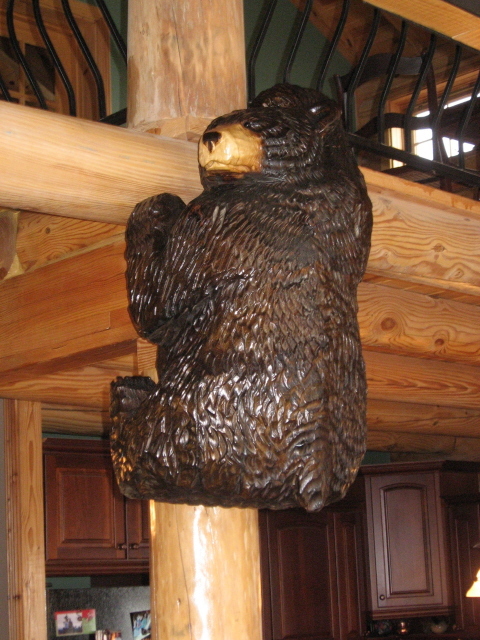 This Column is the Centerpiece in a Log Home Company office. 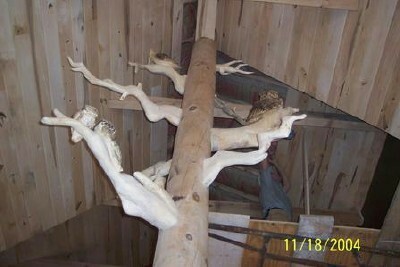 It has a variety of subjects to give potential ideas. 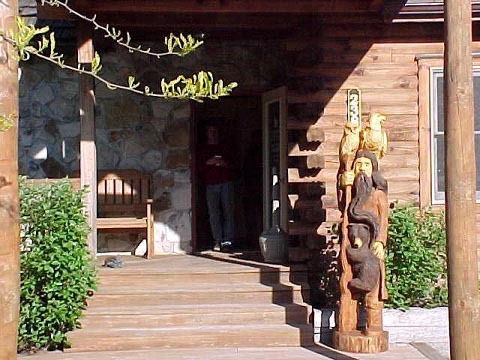 Next photo is the front of their building where a Mountain Man stands to welcome clients. 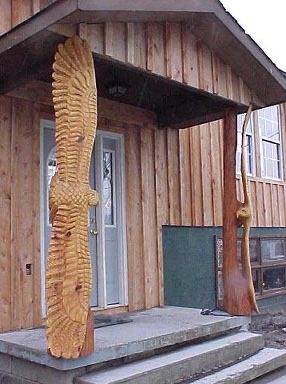 We carved on a few of their "Spec Homes" to give an idea what can be created. 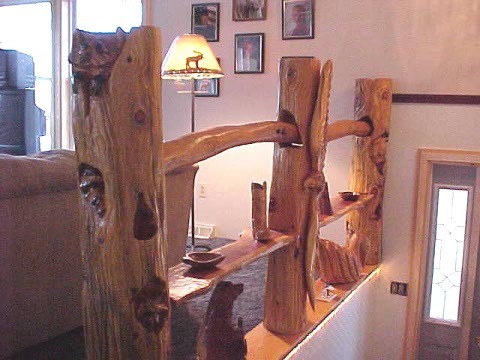 Their clients can view and feel different Artwork ideas. 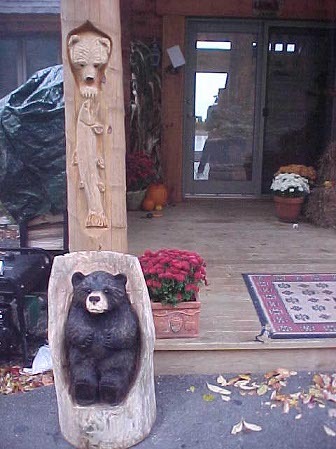 House on left has Bear Heads in the front entry posts, house on right has raccoons. 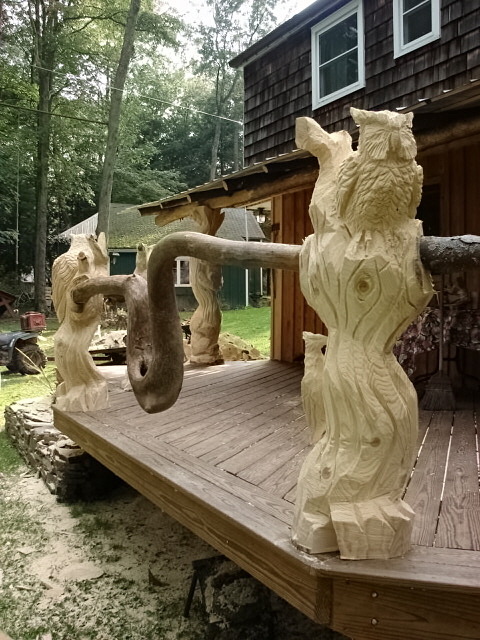 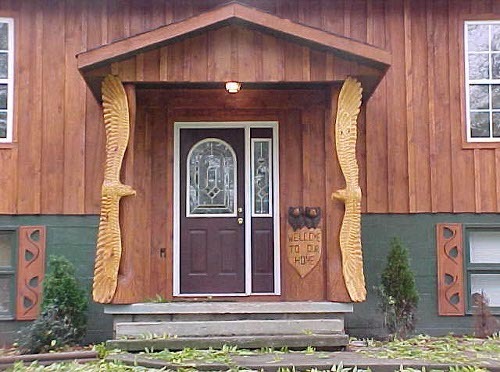 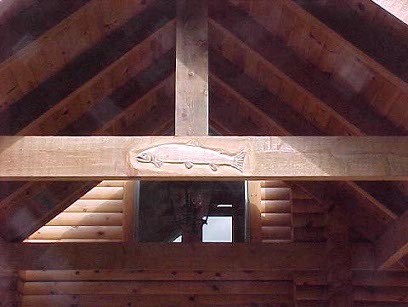 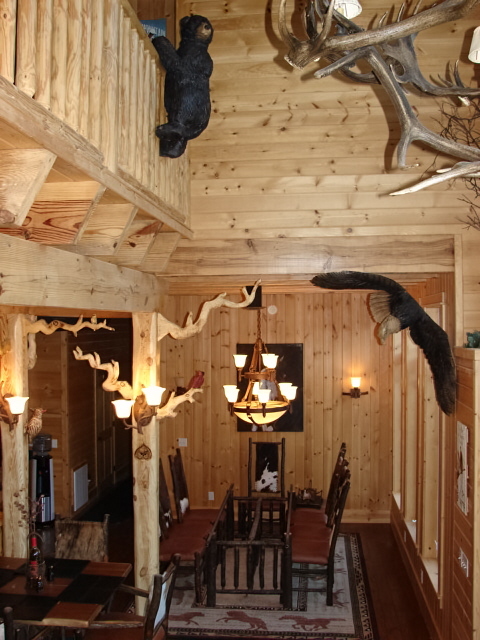 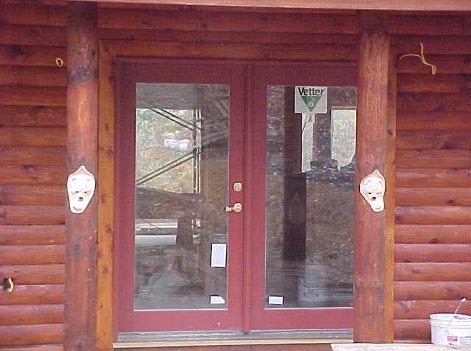 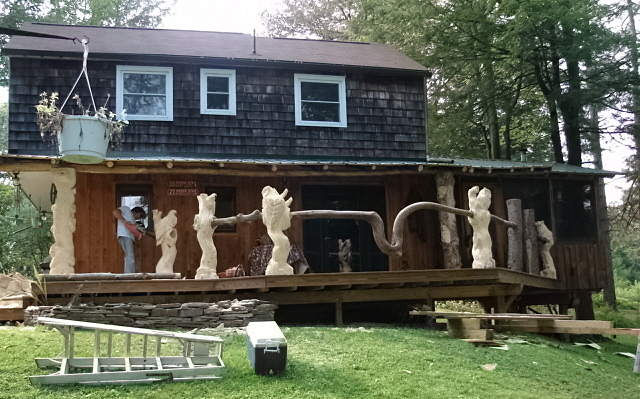 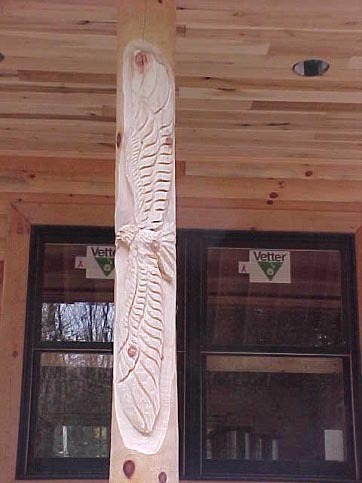 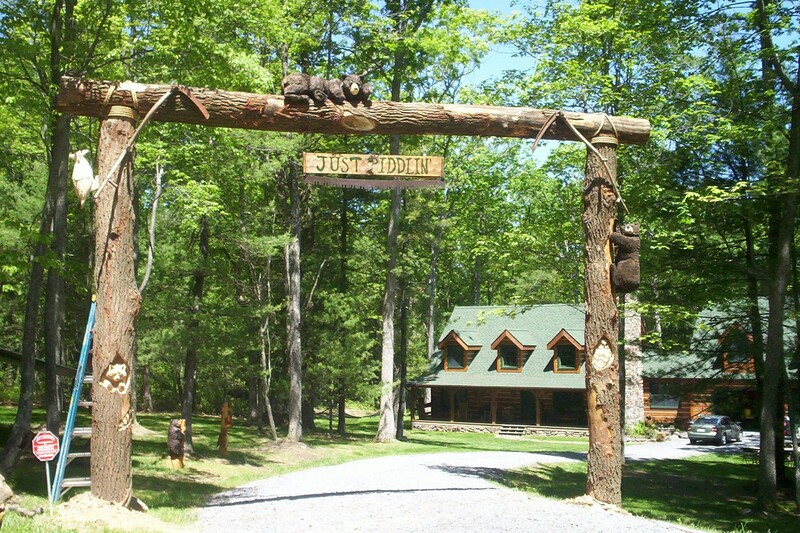 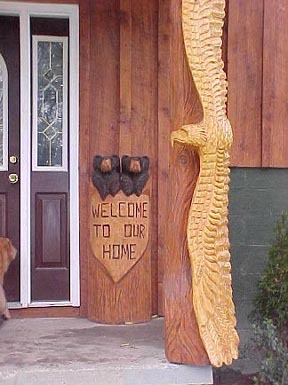 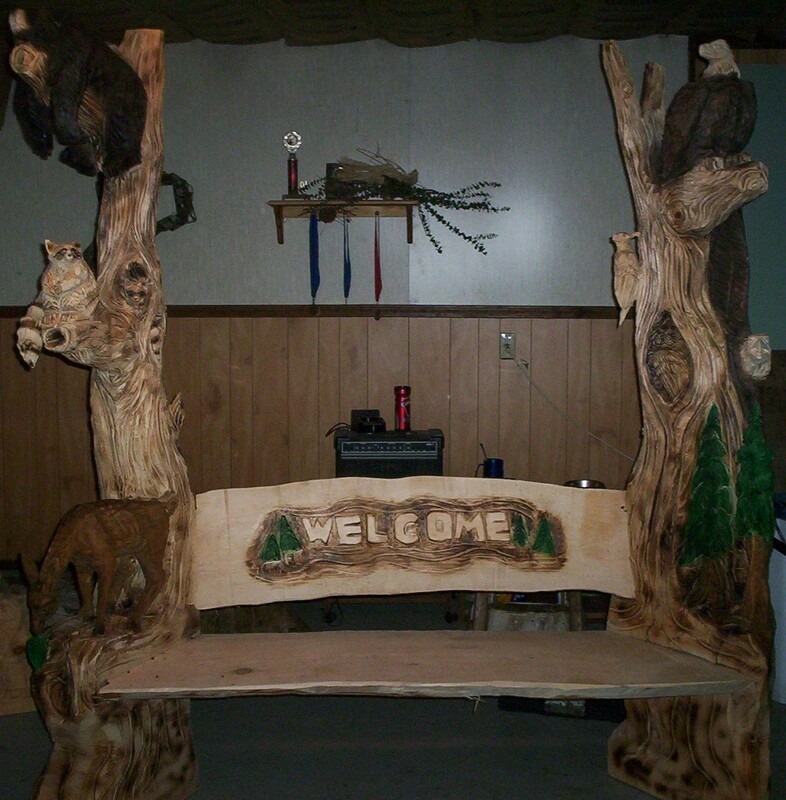 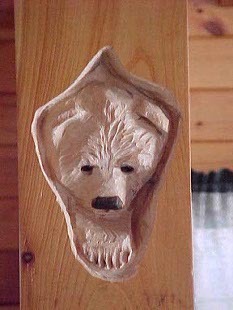 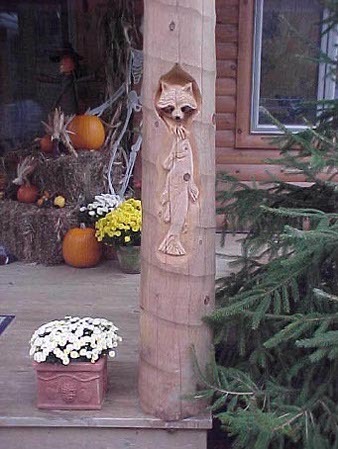 More examples of entry post carvings on other "Spec Homes"
Rick carving Trout in front Entry, photos of close up after completed of Trout, Bear in Hollow with Trout, Raccoon in Hollow with Trout. 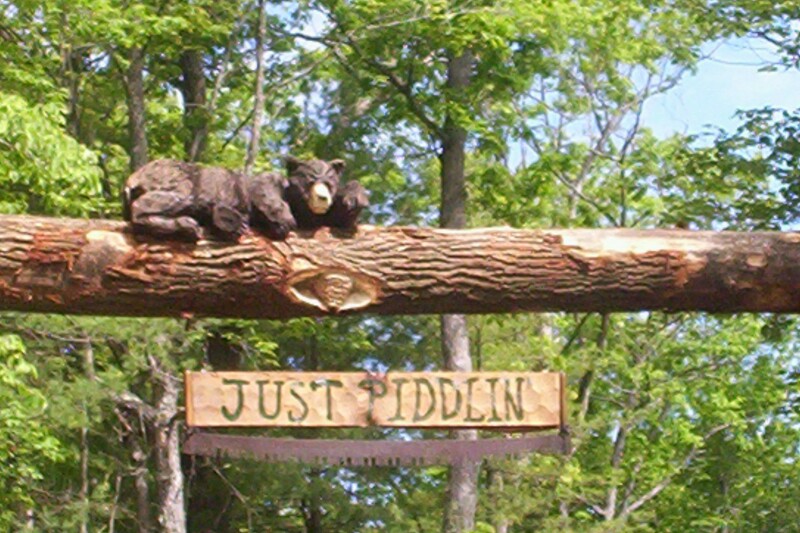 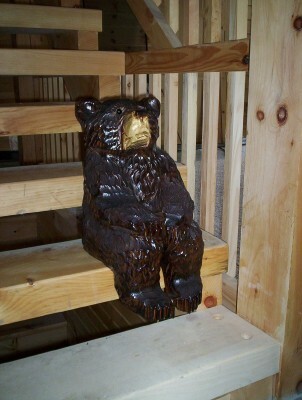 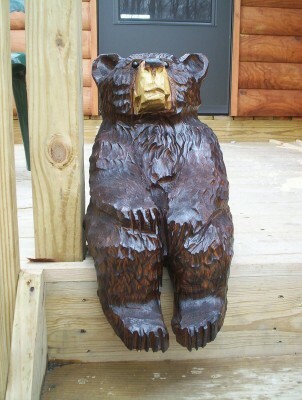 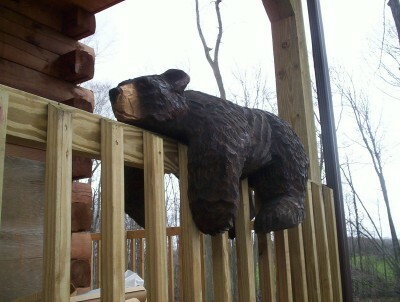 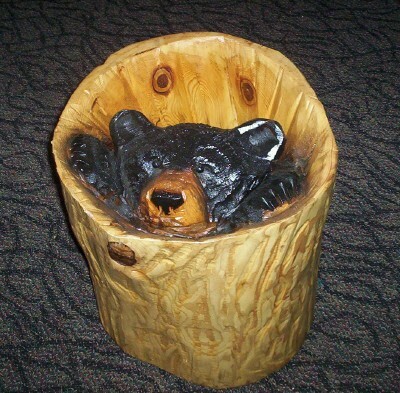 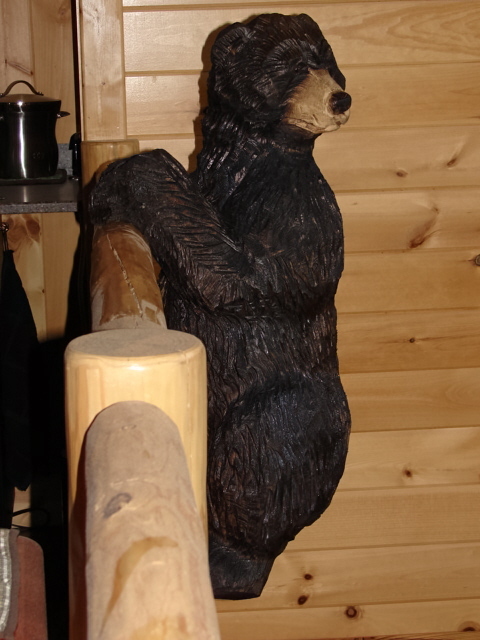 Kickback Bear was added seperately and can be freely placed anywhere inside or out. 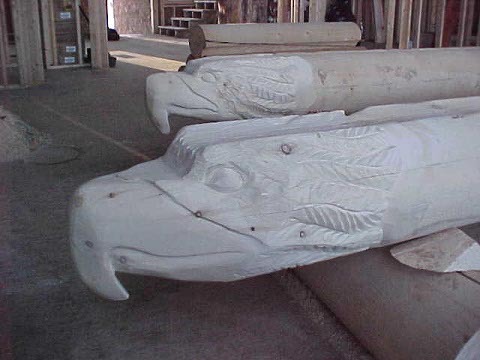 These Eagle Heads were carved at the end of beams that will be attached to the kitchen ceiling and will have pots and pans hung from them. 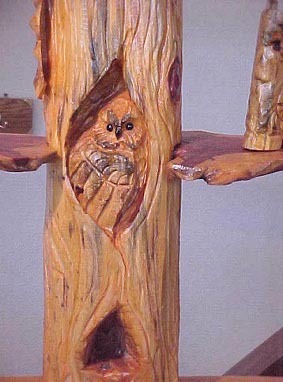 Glass tops are added to make this a great Functional Piece. 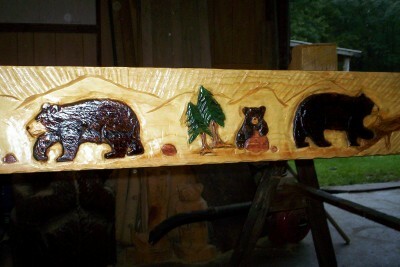 Pricing available on Bears page. 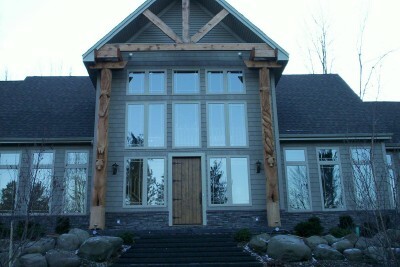 These are photos of our Home. 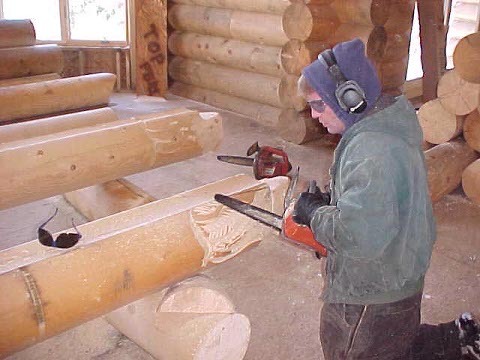 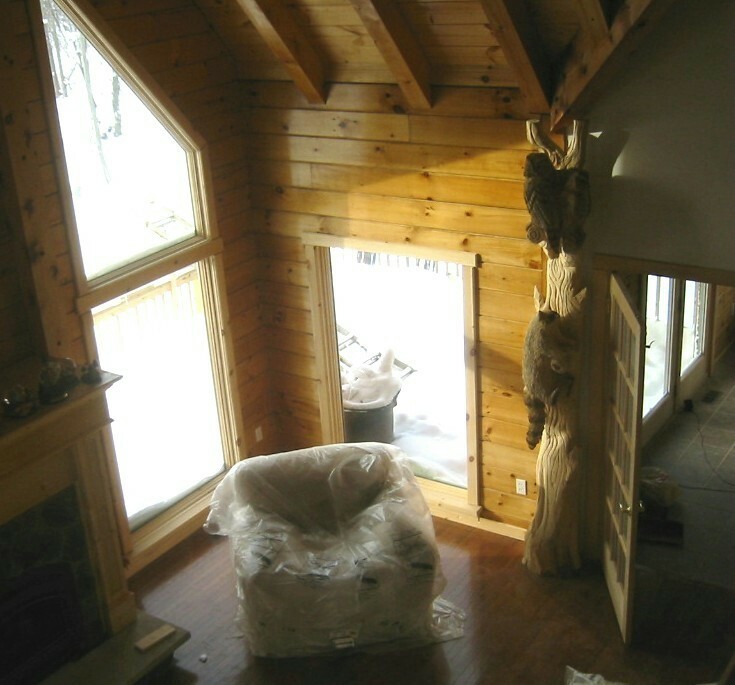 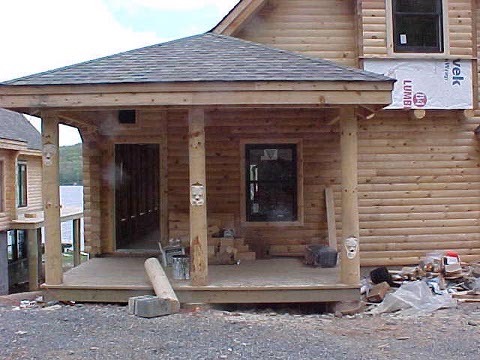 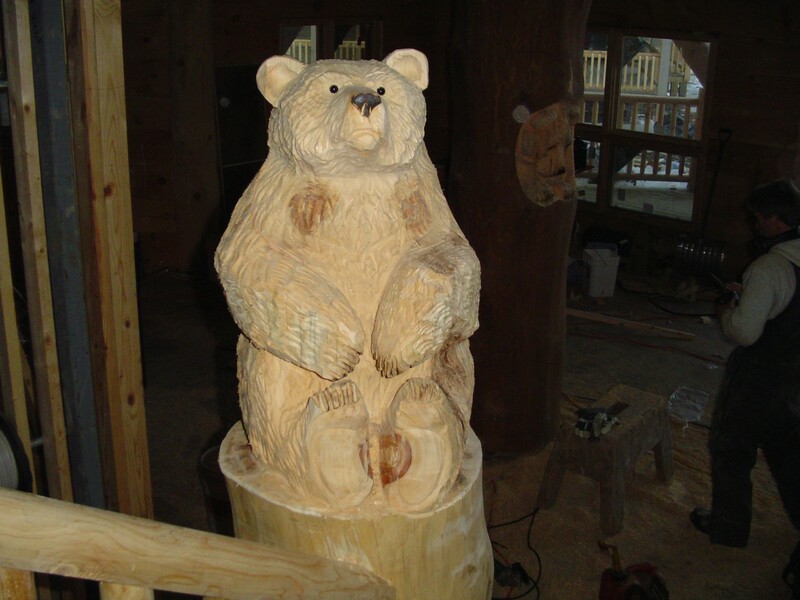 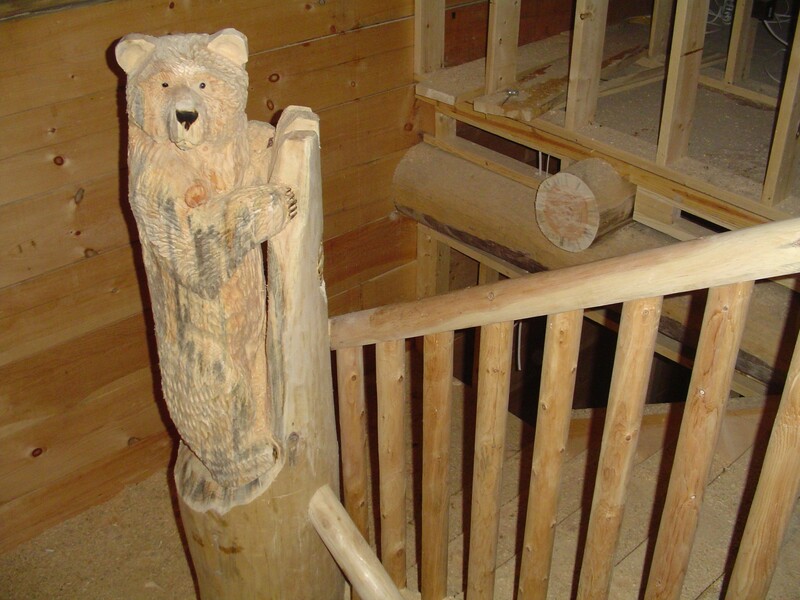 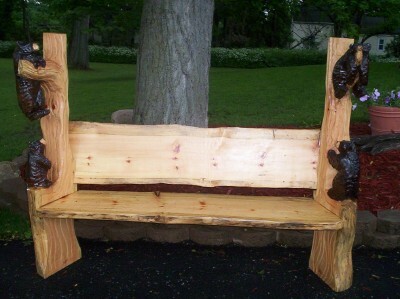 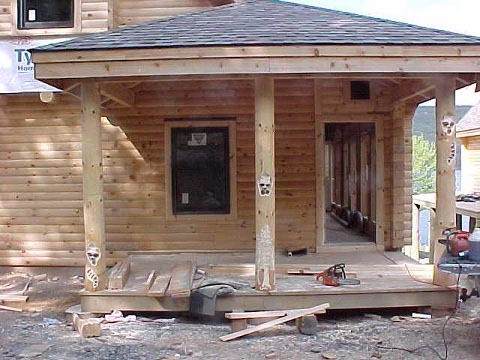 This is where we started creating carvings that could adapt to Log Homes as well as any Constructed Home. 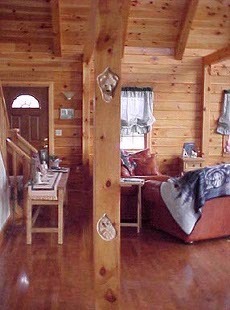 Anyplace you live can be called "Home." 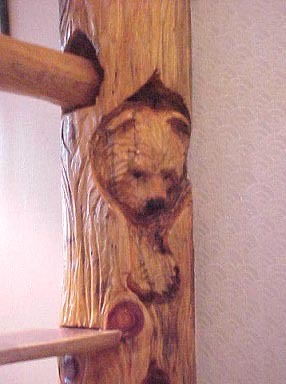 We like to live with interesting creatures in our woodwork. 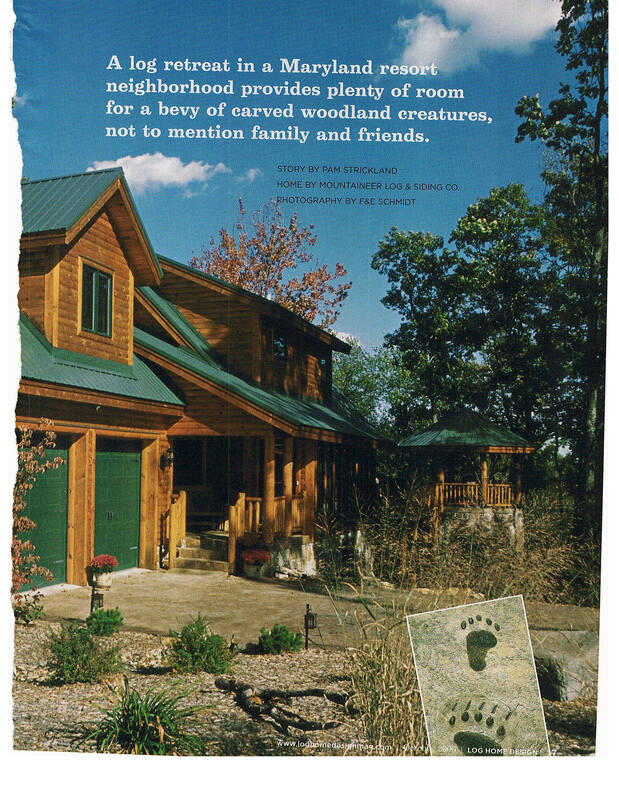 We hope you have enjoyed our visions thus far. 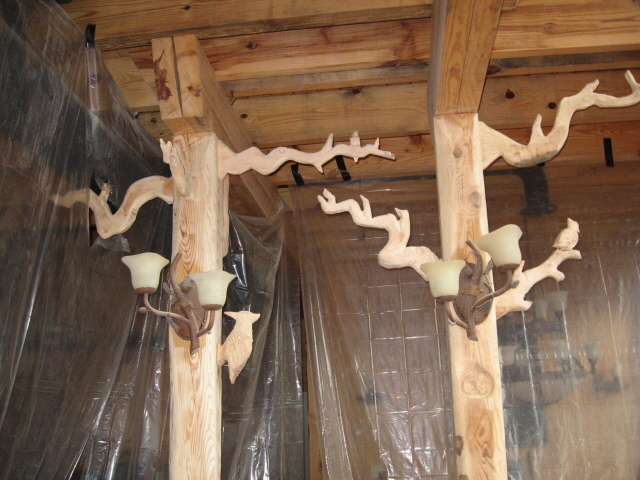 Please don't hesitate to give us a call when you decide how you want to decorate your Home. 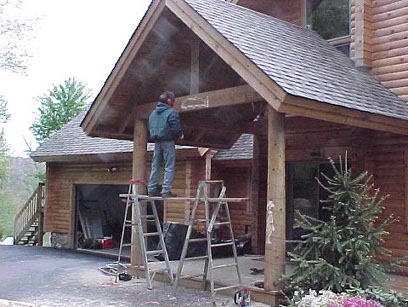 We'd be glad to come over and help you out!